Yoga is a wonderful form of exercise and a way to wind down and relax in the middle of our busy modern lives. 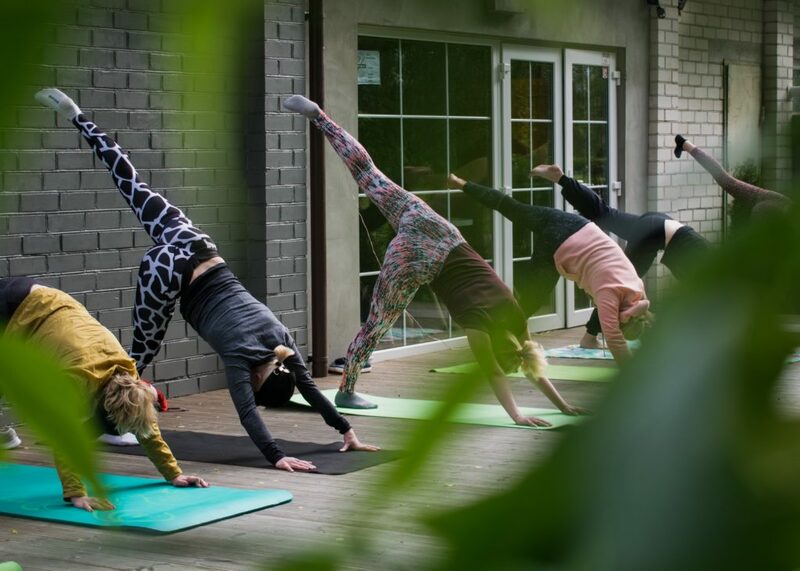 Often though, yoga can feel like an intimidating practice as we see amazing poses on Instagram and find out just how expensive yoga equipment and classes can be. I’m a trainee yoga teacher and have been practicing yoga for years. I was lucky enough to be able to afford a beginner’s yoga course when I wanted to try yoga, but I know that not everyone can afford this expense and I don’t believe it’s essential. Attending a yoga class is a great idea if you can afford it as the teacher will make sure you are getting into postures correctly and you will learn all of the fundamentals. However, yoga classes aren’t for everyone and if you can’t afford to go to a yoga studio you should still be able to practice yoga – yoga is for all! Whether it’s your bedroom, your living room or kitchen. You need a space where you can move your arms around and step back and forth freely, without worrying about knocking your elbows. It’s not important to have a separate yoga space, even just a bit of floor in the middle of a busy living space is enough so long as you can move about. I recommend using something like Yoga With Adriene’s videos for beginners to get you started. These videos aren’t too long and cover the basic yoga postures in a way that is very accessible. She gives options for all bodies and uses language that is easy to understand. There are also a ton of beginner’s yoga books online and blogs offering the basics in things like sun salutations. Don’t bother with equipment – yet. Spending lots of money on a mat, blocks, straps, and leggings is bound to put you off your yoga practice. Yoga should help you destress, not add to your list of worries by causing you financial strain. Consider practicing yoga on carpet or laying out a towel to begin with. A yoga mat is probably the single piece of yoga equipment I would say you will need if you decide yoga is for you, but when you are just trying for the first few weeks, then just practice on your floor. The poses for a beginner shouldn’t make a mat essential. 2. But what should I wear? We’ve all seen the Insta yogis posing on beaches, normally in handstands and wearing very expensive yoga clothes. And sometimes we can all fall into the trap of thinking an expensive pair of leggings will help our yoga practice. I love this video by Rachel Brathen aka Yoga Girl, where she practices yoga wearing all sorts of different clothes. I would advise wearing comfortable clothes to practice yoga. Ladies, a sports bra is a good idea but not essential if you are smaller chested. I often practice yoga in pajamas if it is a slower, restorative practice or I’m trying to wind down before bed. You really don’t need to buy special clothes to start practicing yoga. To begin, wear your old jogging bottoms or a pair of leggings, t-shirts, pajamas. Whatever you like! If you do develop a long term yoga practice those special yoga leggings are a good idea because they are often longer wearing, allow your body to move fully but also can help with things like arm balances were you don’t want your skin to rub against rough materials or you don’t want your foot to slip down in something like tree pose where you are on one leg and one foot is pressed into the other leg. Until you reach the stage where you are advancing your practice that won’t be a consideration and some of the best yoga practitioners (particularly men) will practice in shorts and t-shirts and not worry about what their clothes can do! 3. How much should I spend on a mat? When you are starting out, don’t feel pressure to buy a mat straight away. Often people can fall into the trap of buying a really cheap yoga mat and this can actually hinder their practice. The first mat I bought, curled up, slipped about the place and had no grip. It actually made postures such as downward facing dog more difficult. Then after practicing regularly for six months, I invested £45 in an eco-friendly yoga mat, and it made a huge difference to my practice. I didn’t slip all over the place, it stayed in place on the floor and didn’t curl up and it offered much-needed support for my knees. I also now have a travel mat which cost more than this and its grip is even better. I often layer the two together to get the cushioning and grip. The question of how much to spend on a yoga mat can be a tricky one to answer. Everyone’s body and yoga are different, therefore their requirements in their yoga mat are different. I don’t feel spending hundreds of pounds (or dollars) is ever necessary for a yoga mat. But I do think once you enjoy yoga and are practicing regularly, that a really good mat can take your practice to the next level. Make sure you are practicing regularly before buying a mat. For my first “expensive” mat, I decided that I had to practice at least three times a week for six months. For my second travel mat which cost even more, I had to attend three classes a week for six months before I knew it was worth investing that £60 (~$80). Consider your practice when choosing your mat. For me, grip is the most important thing in a mat, it helps me to stay strong in my downward facing dog and stops me wobbling through my practice. For those with joint problems, you might need a thicker mat to help support your knees, though I would say be wary of super thick mats as they can stop you feeling connected to the floor. Think about where your mat has come from. There are many eco-friendly options on the yoga mat market. While they will often come with a higher price tag, I would recommend considering waiting and investing in an environmentally friendly option that will last for years, rather than buying lots of mats which don’t last as long or have been made in unethical ways. Blocks, straps, and cushions are all fantastic ways to enhance a yoga practice from the very beginning. Blocks can support you in all sorts of poses, straps can help you reach while you are building flexibility and cushions can make your meditation practice more comfortable. However, all of these props cost money and buying quality props will soon add up. I recommend waiting to buy props. You might need their support during your practice, but there are plenty of alternatives you will probably already have at home. Consider using hardback books as blocks while you are starting your practice. A block under the heels in downward facing dog can be helpful for some. When bending, if you can’t reach the floor you might place hands on a block. I have definitely used books for this when I haven’t had a block to hand. Great for reaching when our arms aren’t quite long enough, consider using the belt off a dressing gown or cardigan instead of buying a strap. This is a prop I don’t use often in my practice, but it can be handy to know you have access to something similar if you need it. For many, sitting cross-legged on the floor is uncomfortable. As much as yoga will help with this, for many of us, our hips will just never be happy sitting that way. Cushions can help by raising the sit bones and taking pressure out of the hips. You can also use cushions during restorative practice to make savasna more comfortable. Don’t worry about buying meditation cushions, just use the pillows, cushions, and blankets you already have around your home. Yoga is a fantastic practice for your mind and body. I really do recommend that everyone gives it a try. There are many ways to practice yoga and while I would recommend going to a class, especially if you have any injuries, practicing at home is a great way to start a practice without spending a penny. Hannah Bullimore is a writer and blogger from Newcastle, England. She loves learning about ethical fashion, health, and wellbeing and is an avid reader. In 2019 she will be training to be a yoga teacher and continuing to teach creative writing as a form of self-care. She writes lifestyle posts and book reviews on her blog which can be found at hjbullimore.wordpress.com.